The present neighborhood of Park Slope is built on land that was owned by railroad owner and land speculator Edwin C. Litchfield and sold block by block to developers in the late nineteenth and early twentieth century. 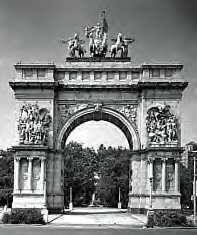 526 acres of land was bought by the city to design Prospect Park, eventually giving the neighborhood its name. A bit about the history, geography, and some landmark buildings of Park Slope in the WPA Guide to New York City. Though Park Slope was settled relatively recently , the geography has a long history, going back to the Revolutionary War that you can read about at The South Brooklyn Network. 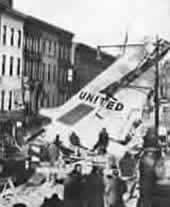 In 1960, a United Airlines jet collided with a smaller commuter plane and crashed on Seventh Avenue and Sterling Place. Read the article on brooklyn.about.com.